I hope you all are enjoying your holiday weekend. I had yesterday off and went to a graduation party and caught up with some old friends, then my daughter and I went to JoAnn's Fabrics and Crafts and spent 3 hours there! We were looking for wedding dress patterns and fabrics. To our disappointment, there weren't many wedding dress patterns, but we did find one we really liked. My daughter is getting married June 19, 2010. We are having the wedding in our home/garden. I will keep you posted throughout the year about everything we are doing, and after the wedding is over, I'll probably do a month-long-daily post showing all the pictures of the wedding decorations, paper-crafts, and other details. Today I worked again, but tomorrow I have off. I'll probably spend the morning crafting, then were off to a Memorial Day Picnic at our Pastor's house. Now, onto my card. I made this card for this week's Inspiration Challenge on Splitcoaststampers. 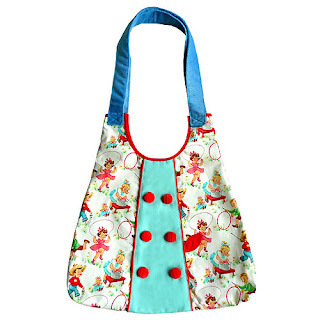 My inspiration piece was a hand bag with a vintage children's print from 'Little Odd Forest'. Its the first picture shown in my post. I know my card doesn't look anything like the Inspiration Piece, originally I started with some vintage patterned paper and the same colors, but it just didn't look right with my stamped image. So, change of plans. I decided to do pink and white, and make the card look more ballerina like. I didn't think I was breaking any rules, because I was still 'Inspired' by the handbag. The vintage children's print on the bag, reminded me of the Crafty Secrets Vintage Children's Images. For my card, I used the Crafty Secrets Image 'Little Dancer'. My card stock colors are Pretty in Pink, Pixie Pink, and White. I colored the image with Copic Markers. I created the sentiment by using a lot of different, words from a bunch of different stamp sets. I added eyelet, two different types of ribbon, adhesive crystals, and baby buttons for embellishment. I also used the 'Swiss Dots' Embossing Folder on the White panel. The main image panel is mounted up on dimensionals. The star was made with a star punch and silver metallic/glitter paper. so ADORABLE!!! love that cute little image and your ribbon is BEAUTIFUL!!! BEAUTIFUL job on this card!! Love the lace, ribbon, cuttlebugging ... just everything!! What a cute bag to be inspired by!! A wedding .. how exciting! I can remember with Carolyn got married ... what fun picking out the colors, dress ... I did the flowers and decorations for the church & hall. Can't wait to see what you create ... enjoy it!! Sorry I haven't visited you before now, things a little hectic at my end with just buying a new business. Lol...with all those link I forgot to say about your card!! Gorgeous and so sweet, I love the image and sentiment. That is so cute Amy!! Love the pink, your adorable image with the perfect coloring, and all the textures. Very girly and gorgeous!! Darling card -- so sweet!! And I look forward to hearing all about the wedding over the next year!! I think it's fine that your card changed. The idea is that you were inspired by the original piece, not that you re-create it exactly. And even though the colors are girly not old fashioned, the image still has that vintage feel because the girl looks like the 30s era Cambpell soup kid. I like how you used the eyelet trim on this. How funny that you spent 3 hours at the store you work at on a non-work day. When I worked at stores, I never went there when I wasn't "forced" to. Even though I am an excellent seamstress, I don't think I would tackle making my own wedding dress. In fact, I didn't. But I also had a very informal wedding so I didn't need a gown. Anyway... I have made dresses for special occasions and dawdled about finishing them until almost the deadline then tried them on and they looked awful on me. So I don't waste my time or money anymore. At least with a store bought dress you can try it on and see how it looks first. But... I hope you have better luck with your daughter's dress than I do. Oh how exciting. I love weddings. I made my wedding dress many years ago. I think it is so neat that you will do it in your own beautiful yard.. So special. Love the card too..I really like all the ribbon and lace...Super job.